Boardwalk Hall, Atlantic City will be the location for Claressa Shield’s attempt to become the undisputed champion of the world. This Saturday, in only her ninth professional contest, T-Rex will look to add the WBO Middleweight title to her already impressive collection. Of course Shields is just one half of that contest and, in the other corner, Christina Hammer will be confident in her own ability to pull off a perceived upset. Hammer, born in Kazakhstan and living in Germany, has been a professional since her opponent was just 14 years of age. In ten years of professional boxing Hammer has been at the forefront of European female fighting. Cecilia Braekhus is the obvious flagbearer – and, indeed, the only other undisputed champion – but Hammer has been regularly showcased on German terrestrial television and was one of the first female fighters to gain mass media attention. A bona fide world champion since 2010, she has subsequently been involved in 15 world title fights in which she’s unified – at one time holding both WBO and WBC belts – and became a two weight world champion. The 28 year old naturally boxes from range with, genuinely, light and bouncy footwork. She tends to work her way sideways around the ring, as opposed to just marching forward, and peppers away with the left jab. A fighter who looks to control the fight and pick off the rounds instead of chasing the finish, Hammer uses her height to advantage and doubles up on her punches well. A real highlight, for me, is a rolling right hook that often breaks through the guard of her opponent. 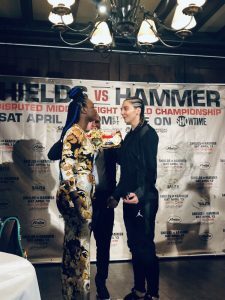 Shields, the betting favourite at 1/4 (Hammer can be found at 3/1), is equally methodical in her approach to each contest with three of her last fight bouts ending in shut-out victories. Flak has been attracted for such an approach with critics labelling her fight-style as ‘boring’ but, evidently, it’s effective and continuing to flourish for the American. Two times an Olympic champion, Shields is no stranger to dominant success and has found herself at the top of the women’s game pretty much since she turned professional in 2016. Self marketed as “The Greatest Woman of All Time”, here she is headlining the fourth televised card of her career – something unprecedented a mere five years ago. It is likely that she will box reactively, as opposed to proactively, come Saturday night and respond to the work-rate of her German opponent. In doing so she will be able to take a measured approach to nullify the threat posed by Hammer. Fireworks are unlikely but this is a genuine “super fight” of women’s boxing and it’s by no means a foregone conclusion. The undercard features two exciting heavyweight contests – and I’m not talking about Samuel Peter vs Mario Heredia – with Jermaine Franklin taking on Rydell Booker and Otto Wallin fighting Nick Kisner. Both contests will be over 10 rounds. Franklin will be looking to record the 18th victory of his professional career, after nine months without a fight. The Saignaw-fighter has been doing the media rounds ahead of this particular contest and recently declared himself “the best heavyweight prospect, period”. That statement is questionable given the meteoric rise of talents such as Filip Hrgovic and Joe Joyce. The unbeaten fighter is determined to vindicate Dmitry Salita, who signed the heavyweight last year, and start proving his worth at the top end of the heavyweight division. Booker, 13 years older at 38, will look to record his fourth consecutive win and advance his record to 26-1. That single loss came at the hands of James Toney, in a WBC title eliminator, back in 2004. His career stalled in the aftermath with a lengthy spell in prison for drug-related offences. A win against Franklin would put his name back on the map of American heavyweights, who seem to always stumble into fights they rarely deserve. Otto Wallin is a big, angry Swedish fighter who has been knocking around the European scene for a while, now. Hopes have been high but, for varying reasons, we’ve yet to see Wallin really kick on. Now based in New York, signing with Salita Promotions, he’ll look to crack the American market. 20-0, the 28 year old’s best win was in his last fight, 52 weeks ago, against Adrian Granat. Wallin controlled the, all-Swedish, contest with considerable ease and displayed his ability to box and move, whereas in previous fights he has been boxed in as a brawler. Having given up a mandatory challenger position for the European title – against Agit Kabayel – he won’t be looking to hang around and Nick Kisner, let’s have it straight, is merely an opponent designed to ease Wallin back in after over a year out. Having campaigned almost exclusively as a cruiserweight, don’t expect him to be able to live with the physicality of his southpaw opponent. Shields vs Hammer, then, to become the undisputed middleweight champion of the world. Boardwalk entertainment, befitting of Broadway.